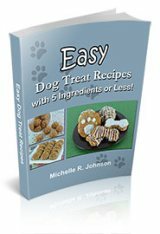 Natural dog treat recipes can come in many shapes and sizes. 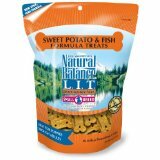 When looking for a natural dog treat, you want to find one that is as close to the original food ingredient as possible. So, the least amount of processed and artificial ingredients, makes an overall better choice for an all natural dog biscuit. Using greens, such as Collard Greens, is a fantastic way of introducing more vitamin K, A and C into your dogs diet. Not only will your dog benefit from the extra vitamins, she'll also get healthy fiber and many nutrients that have anticancer protecting properties. 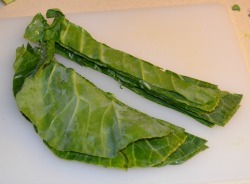 The fiber in collard greens is quite high, about 5 grams in each cup. 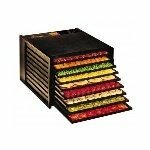 That makes these greens a logical choice in supporting a healthy digestive system. Yet, the greens in this natural dog treat recipe are paired with even more healthful ingredients. The ground ginger, flax seed and molasses are all nutritious for your homemade dog treats. 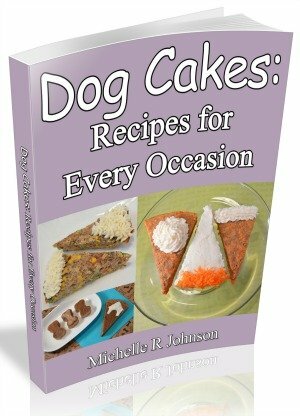 We used wheat and grain free flours in this dog treat recipe. Although buckwheat flour sounds like it contains wheat, it does not. Buckwheat is a type of seed and is a hardy and flavorful flour to use. Then we chose almond flour which is made from blanched almonds and adds a sweet nutty flavor to the dog treats. Wash the Collard Greens leaves. 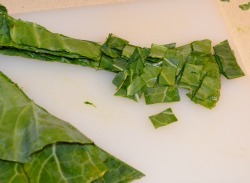 Cut the ribs out of the greens as shown (pictures below). Lay the ribless greens on top of each other. Cut strips and then smaller pieces from the greens about 1/2 inch or smaller. Place the pieces into a microwave safe bowl and add the tablespoon of water. Cover tightly with plastic wrap and leave a small opening on one side of the bowl. Carefully remove the bowl from the microwave. Uncover and set aside as you prepare the other ingredients. In a large bowl, whisk together the buckwheat flour, almond flour, ginger and flax seed. In the greens bowl, stir in the eggs, molasses and canola oil. With a sturdy spoon, stir together until combined. Lightly spray a sheet pan with non-stick cooking spray. Using a 1 inch cookie scooper, place prepared scoops on the baking sheet. Continue making balls until your mixture is gone. With damp fingers, press down any pieces of greens that are sticking out of the cookie ball so they do not burn. Turn off the oven and leave the natural dog treats to cool for about 2 hours. 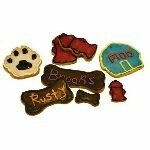 Storing - These and other natural dog treat recipes are made without preservatives. So, to keep your homemade dog treats fresh, store these in the refrigerator for up to 2 weeks. 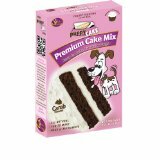 You can freeze these green dog treats for up to 6 months. 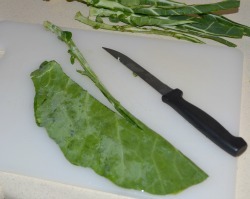 Yield - Using a 1 inch cookie scooper you will yield 14 collard greens dog treats. Wheat & Grain Free Flours - Customize this natural dog treat recipe with your choice of flours. Instead of buckwheat flour, try brown rice flour. Or, if your dog is not sensitive to wheat or grains, you can replace the flours with whole wheat flour. Almond Meal or Almond Flour? - They are two names for the same product. Whatever your packaging may say, finely ground and blanched almonds make a tasty and sweet alternative to wheat or grain flours for your homemade dog treats. Molasses Alternatives - Although we love blackstrap molasses for it's earthy sweetness, you can substitute it for honey. 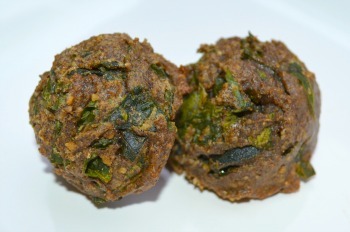 Try Spinach, Kale & More - Depending on what you can find in your local market, and what is in season, you can use other greens in this natural dog treat recipe. Try the same amount of spinach, kale, mustard greens or turnip greens. For convenience, you can also use a 10 ounce package of frozen greens. Thaw the greens and the squeeze most of the moisture out. Then follow the instructions after preheating the oven. Collard greens may not be the first things you grab when making homemade dog treats. 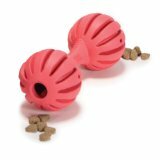 But, a little extra effort of preparation of these greens is rewarded with a very healthy and natural dog treat recipe that your dog is sure to bark with approval. Love your dog with these healthy ingredients and your dog will return the favor for many more years to come.